Screenprinting is our speciality :-) When founder Jordan Carr first opened the doors of Oddities Prints in 2015, he brought with him a wellspring of screenprinting knowledge and expertise. With over 18 years in the game, this know-how translates to exceptional printing standards across all processes we offer. Whatever your custom printing needs, we are focused on delivering a most excellent experience and end result based on your vision. 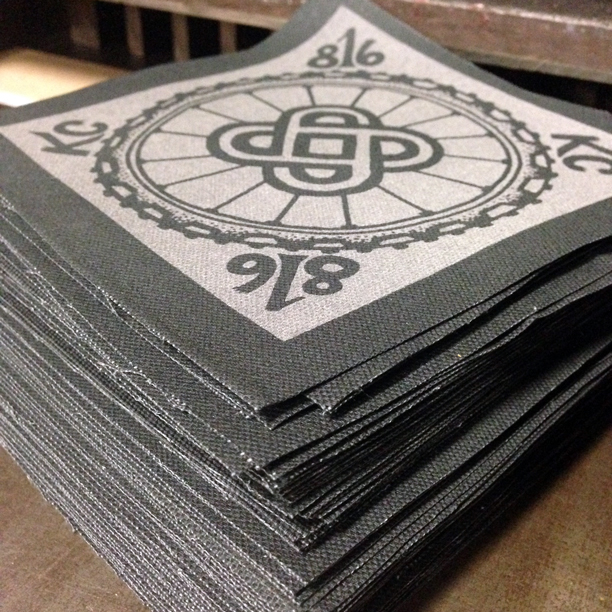 Screenprint (aka Silkscreen) is a stencil based process used commonly in the production of printed apparel, hats, gig posters, event merch -- more or less anything which can be made flat. This technique allows for high-quality impressions for production runs both large and small. Being an owner-operated shop, we’re able to take on print jobs that other spots might consider too small, complex, or unprecedented. Whatever project you’ve got in mind, drop us a line and we can get a conversation started with our press operator about how best to actualize your vision. For most screen printed jobs, you can expect turnaround to be anywhere from 5-10 business days from the date of proof approval. If you have an upcoming event or desired in-hand date, be sure to share that in your quote request so we can help quickly meet your deadline. If you need something completed in 2-4 business days, rush fees can be calculated upon request. When preparing your artwork for print, it’s best to work from vector, native digital files, or even an original drawing if available. As far as formats go, .ai or .eps files with all text converted to outlines are ideal. Any gradients or mid tones will be printed with a standard halftone pattern of 36 LPI. If you do not have vector art, or are unsure which format to use, please send all versions available. We’ll be able to diagnose the artwork and get it headed in the right direction. ‘Press-ready’ artwork means all elements are prepared to be color separated, add trapping, etc as needed to burn your image onto a silkscreen. If you need us to setup artwork for you, we perform this service at the rate of $75/hour with a half hour minimum. When designing or laying out your artwork, bear in mind that screen mesh can be built *very* tight so as to allow for a crisp impression. As a result, details smaller than 2pts thick or under 12-16pt font (depending on the style) cannot be maintained on press. If you are unsure about whether or not your artwork will translate well to silkscreen, send over your file and we will help you determine how best to recreate the image. Plastisol ink is the industry standard. It’s especially ideal for artwork which requires an exact Pantone color match and/or super opaque impressions. Waterbased Ink is an ultra thin, environmentally friendly alternative, with an almost "feel-less" ink deposit. When printing textiles, the result is a super comfy garment with a nice 'vintage' appearance, due to lighter colors being slightly transparent. Water based ink is not compatible with designs which require an exact Pantone color match. Discharge ink -used exclusively in textile pritning- involves a process which chemically removes the shirt's fabric color in order to replace it with an ultra-thin pigment dye. This leaves an incredibly soft feel and vibrant colors on even the darkest of shirts. Discharge is only compatible with 100% cotton garments. Price will be determined based on the number of ink colors, locations, and type of material we are printing on. Additional fees may apply for assorted finishings or other specialty ink applications. Note: For standard print pricing, we mix all colors by eye. If you need an exact Pantone match, we will order in the precise ink color for an additional charge. In any case, the larger the print run, the less expensive per-print your job will be. 50qty shirts on 100% Ringspun Cotton Unisex Tees: $390. 100qty shirts on 100% Ringspun Cotton Unisex Tees: $690. 100qty shirts on Tri-Blend Heather Unisex Tees: $850. Or maybe you’re looking for that same artwork on a 11x17” gig poster? 50qty posters on 100lb. cover quality paper stock: $335. 100qty posters on 100lb. cover quality paper stock: $466.